Ideally, the priest, the choir director, and other relevant church workers should share texts with you that will be use for the service. You should be able to get the hymns and the music the choir and soloists will perform a week or so before the service. Some people who are responsible for the music are strangely territorial and may give you trouble, sadly. Explain to them as musical performers that there is a need to try and make the signed hymns look rhythmic and clarify any old-fashioned English and complex concepts as much as possible. If they cannot relate to this, go over their heads. 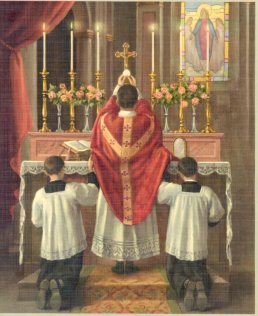 The prayers of the faithful are usually printed out for the lector and should be available the same day. Ask if a second copy can be made for you. Some homilists (people who offer the sermon) may print out notes for themselves; ask them if you could have a copy to read shortly before the service and get there early in order to do so. The readings and other special liturgical units that may be added on special Holy Days are standard on a three-year cycle: A, B, and C. Know which cycle you are in and get a copy of the missal so that you can read it beforehand. For translations into glossed ASL (written in English to show which signs to use) of the various readings, see Signing the Scriptures, Year A or Signing the Scriptures, Year C. Most of the readings have also been videotaped in ASL and can be purchased from Deaf Missions.